We Drink Your Milkshake! : BATTLEFIELD AMERICA Trailer Breakdance! I mean Breakdown! BATTLEFIELD AMERICA Trailer Breakdance! I mean Breakdown! It's so strange, but we absolutely love the Step-Up series. I know. We've mentioned this many, many times. But now our love has spread into almost any street dancing movie. We already know that STEP-UP 4 will be released July 27, but hold the phone for just a second. It seems the people behind another dance film, YOU GOT SERVED, is dropping this little doozy of a film in early summer. It's called BATTLEFIELD AMERICA, and, from the looks of a trailer, follows two kid crews as they prepare to battle each other. Because how do you differentiate yourself from all other dance movies? Why make it about children of course! Check out the trailer and the breakdown after the jump. Biggest battlefield? But I've never heard of it. They stomp so hard they shake the camera. I can't take a ten year old white kid with blonde corn rows seriously...ever. Electric Slide. Old school yo. It's like West Side Story with two groups of different backgrounds dancing it out. He threw him over himself with his leg! Camo pants is obviously the preferred street dancers' choice of pattern. Only thing that could make this movie better? Moose. It looks so ridiculous, but I'm so excited! I'm a sucker for dance movies, and I will be seeing this at midnight...if at all possible. Oh, could we please have a crossover movie for the sequel with the people from the STEP-UP series? Genius. The Step Up movies can't be compared to You Got Served & I'm pretty sure Step Up 4 won't do anywhere near what BattleField America will do. The Step Up movies are corny! Looking forward to BFA!!!!!!! The last "kids" movie I went to see was HUNGER GAMES & that was NOT a kids movie whatsoever. 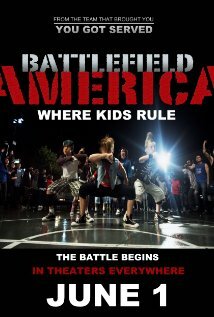 BATTLEFIELD AMERICA is a movie I will definitely take my kids & cousins to go see. Dancing is positive, how can you argue with that? WOW! I've never been able to dance so I LOVE watching dance movies lol. I can't wait to see this!! !